Jim Huber is a nationally published cartoonist, with cartoons that have appeared in, most notably, National Review magazine. He's been drawing cartoons ever since he was too lazy to draw realistic pictures. Actually, he's been honing his skills since he was about 5 years old (that's 40 years), but has been freelancing cartooning for over 30 years, starting with New York Newsday. He was a cartoonist and graphics editor for his high school and college papers. In college, in 1993, he started Politically Correct, which he continues to do today for papers, publications, and Web sites across the country. Jim's current professional cartooning work extends beyond his political cartoon. 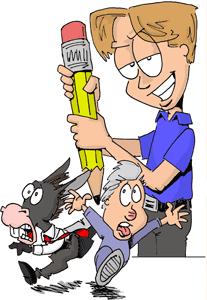 He has drawn cartoons for various political, private, and commercial clients. In addition, Jim owns and operates a web design firm, Huberspace, which specializes in conservative/Republican websites.